BERLIN/PARIS (Reuters) – France wants a more ambitious reform of the euro zone than the one sketched out by Angela Merkel and will press the German chancellor for additional concessions on a euro zone budget and banking union in the weeks ahead, French officials say. After months of silence and mounting criticism, Merkel offered a detailed response to French President Emmanuel Macron’s calls for an overhaul of how the single currency bloc is run in a German newspaper interview on Sunday. Macron has been calling for a far-reaching reform of the euro zone since coming to power a year ago, arguing that Europe’s most successful symbol of integration needs to be overhauled to prevent a repeat of the sovereign debt crisis that nearly tore it apart in 2010-12. But without German backing his plans won’t get off the ground, and even if Paris and Berlin can agree a common position, they face a struggle to persuade other euro zone member states that further reforms are necessary. 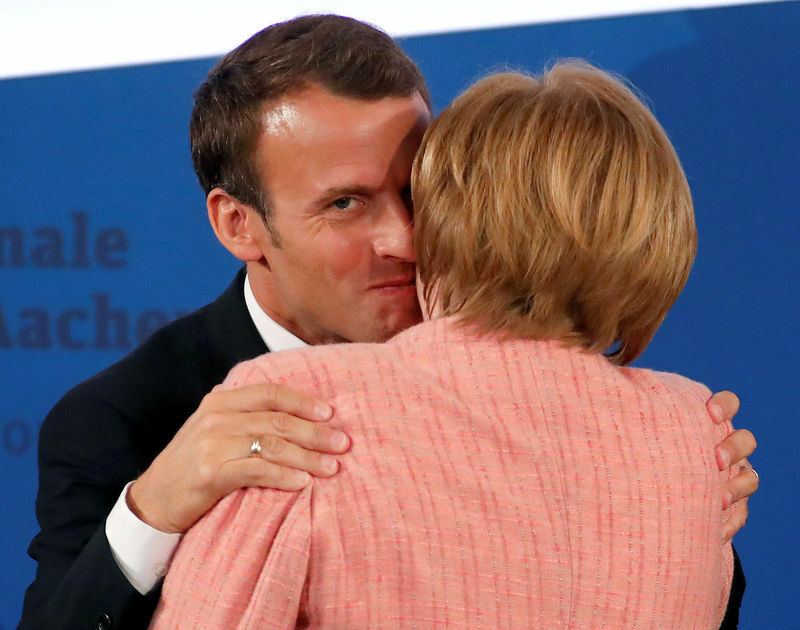 French officials, speaking on condition of anonymity, noted that Merkel had embraced a number of Macron’s ideas, including the creation of a European agency to handle the issue of asylum-seekers, transnational lists for candidates in future elections to the European Parliament and a reduction in the number of EU commissioners in Brussels. But they said more work was needed to align the French and German positions on the euro zone, the heart of the reforms Macron is focused on. French Finance Minister Bruno Le Maire is expected to deliver that message when he speaks at a conference of family-owned companies in Berlin on Friday. “There is a rapprochement on euro zone reform, notably on the idea of an investment budget. The chancellor made clear that the current euro zone instruments are insufficient,” one French government official said. The question of whether the euro zone should have a common budget, how it might be funded and how it would be spent has yet to be settled. Neither is there agreement on how to complete the banking union through a pan-European deposit insurance scheme. Several officials said Macron had sent internal signals that he was prepared to walk away from formulating a joint reform proposal if Berlin did not budge, although some viewed this as an unlikely outcome at a time when Europe can ill afford a fight between its two most powerful member states. Still, it has raised pressure on Le Maire to wring more concessions out of his German counterpart Olaf Scholz in the run-up to an EU summit on June 28-29 at which Paris and Berlin have promised to present their proposal. The two ministers and their teams will meet in Paris on Saturday. The French side views the meeting as a critical opportunity to narrow differences before a June 19 meeting between Merkel and Macron at Meseberg palace, north of Berlin. In her interview with the Frankfurter Allgemeine Sonntagszeitung, Merkel tried to strike a balance between moving toward Macron and appeasing hardline conservatives at home who are pressing her not to make any concessions. French officials close to Macron have concerns about a number of Merkel’s euro zone proposals, including her plan to limit the size of any investment budget to the “low double-digit billions of euros”, her idea that the ESM bailout fund should share economic surveillance duties with the European Commission and a suggestion that it could force debt restructurings. While France does not rule out debt restructuring for member states that run into trouble, it opposes the idea of a mechanism that would make them more or less automatic, fearing this could fuel market unrest. Merkel was vague in the interview on the completion of the EU’s banking union project and France is still pushing for Berlin to commit to a clear timeline on the introduction of a European Deposit Insurance Scheme (EDIS). There is more optimism about reaching agreement on another element of banking union: a backstop for the so-called Single Resolution Fund (SRF).